Tiffany floor lamps sparkle with traditional style. This design offers plenty of charm and a colorful, heart and leaf motif fashioned from Tiffany style glass. 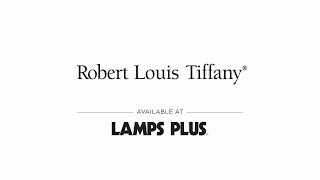 Use Tiffany lamps to bring a timeless style to your home. This floor lamp has classic Tiffany-style glass that glows with a kaleidoscope of color. The top glass features a colorful leaf pattern in a heart-shaped motif, with blue, green and brown tones of Tiffany-style glass. A trio of bulbs behind the glass offer warm illumination, and are controlled by the triple pull chain design. 67" high overall. Base is 12 1/2" wide. Shade is 20" wide at the bottom. Uses three 100 watt standard-medium base bulbs (not included). Three on-off pull chains. 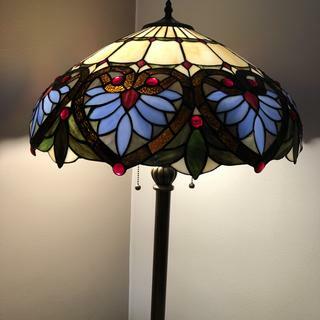 Tiffany style floor lamp from the Robert Louis Tiffany brand. Shade features over 200 pieces of hand-cut art glass in a heart-leaf pattern. Assembled using the copper foil soldering process. Patina bronze finish base and column. Metal construction. Base is decorated with a relief-style leaf pattern. BEST ANSWER: Hi - This has an approximate weight of 15 pounds. What kind/size of finial comes with it? BEST ANSWER: It is a small metal decorative finial that measures 1 3/8" in height. A small metal finial. It looks great but if you wish, it could be changed out for a different one that you can buy separately. BEST ANSWER: Actually, this design is made from Tiffany style glass. The shade is made by taking brightly colored pieces of stained glass and joining them together with copper solder joints. The pieces of Tiffany art glass are tightly held in place by the soldered joints. So tightly, in fact, that they don't vibrate and resonate sound when tapped like a normal window pane or drinking glass would. Because of this, they create a dull, muffled sound when struck, a sound interpreted by many as being plastic. You can tell you have a real Tiffany style glass shade by the brilliance of the colors. Some glass will have texture to it, and you may be able to see slight imperfections and irregularities in the glass itself. Finally, the art glass shade will be much heavier than a plastic one. It's colored glass, not painted. I've had it for a while now and still love it! Great Product I would buy again. We purchased our first Tiffany floor lamp recently and we absolutely love it. It is beautiful in our home with our colors and just sets the room off. We are able to use 100 watt bulbs for reading or put in lower wattage for effect. There are three bulbs so we have choices with the amount of the light and the direction. The sales people were wonderful, too. It's a great floor lamp..and makes the room inviting. very close design to the tiffany, so I like it a lot, it's very very pretty. Also - big but not too bulky. One thing to consider when you buy a lamp like that is if you're sitting high enough you can actually see the bulbs when you look at the lamp (because it's like you're looking up to see it and you're eye is not leveled enough to see just the decorative part). However - We like it!!! We use in library behind the loveseat; lighting just right for reading. Excellent in a "vintage" home. Wow!!! Ads a whole new look to library/office! Placed lamp in office, next to reading chairs. With three bulbs, it's very bright. Love the look and it makes the library books/cases stand out!!!! Great service and beautiful lamp! We were looking at floor lamps in consignment and thrift stores after not finding anything at department stores. Then we saw this at Lamps Plus and it was on sale for less money than some basic floor lamps that were used. The shade does wobble some when the chains are pulled. This has 3 separate lights so you can put one bright one for reading and 2 dimmer ones for accent lighting. Or, use 3 bright ones and put a cord dimmer on it. We have gotten very nice compliments on this lamp. We really liked this floor lamp, unfortunately upon our first purchase the lower pole stripped out in the base. We purchased a second lamp and after fourteen months noticed the lamp was leaning against the wall and determined once again the lower pole had failed at the base. We believe the large shade and three light assembly is to heavy for this pole design. The warranty is only 12 months so now we are trying to get replacement parts to salvage the situation. This lamp looks great! The base is really pretty and the colors in the glass are lovely. Bought it for our family room but it could honestly fit in any room. It was packed well and arrived promptly. This brass floor lamp is heavy and very stable. It appears to be of solid brass. Comes in three sections that thread together, with lots of threads in each joint for making very solid connections. Lamp is largely pre-assembled, requiring only threading together the 3 sections; no wiring assembly is needed. Lamp was very well packed in form-fitting styrofoam blocks packed in a large, stout cardboard box. Lamp is stable, rigid, and very beautiful. We thoroughly enjoy the Heart Motiff-Style floor lamp. It's tall enough to give off bright lighting to read by. The colors are stunning when lit. Everyone that sees it, says it's beautiful. We are happy with our purchase. Love this lamp. The colors are gorgeous. Very well made and fits perfectly in the spot for which I purchased it. Gorgeous Lamp, would buy a second one. I use this lamp in the den which adds alot of charm to the room. It is also good for reading when you need just the right amount of light. Adds light in a large living room. Colorful aspect improves décor. Love this lamp. It is beautiful and functional. In office at this time. Have moved it around to find best spot. I bought this Floor Lamp based on my Table Lamp of the same kind. 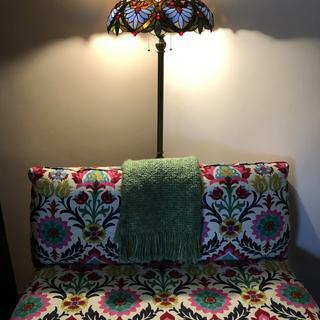 I loved the table lamp so much that I saw this on sale and had to add it to the room. It was a little bigger than expected but I have it in the corner of the room and it looks fantastic. I love the colors and with three bulbs being able to be turned on it gives you a good varitey of lighting available. I have LED bulbs in this and it is very bright with all three on... Turn just one on and it gives you a different feel in the room. Love the way the room looks when they are on! The Tiffany floor lamp is beautiful and provides light for my living room.It is a conversation piece too . 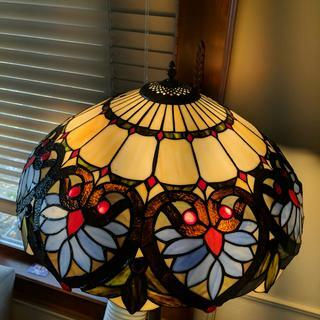 I would recommend this Tiffany lamp , absolutely. The colors are vibrant.. plenty of light . The light is a whiter light. This makes the beautiful glass striking. Have had problems with the pull chains. One has come off. One other sticks in the pulled position. Lamp is lovely, hopefully can fix the pull problem. The colors are muted yet bright, not gaudy, and the pattern is pretty. I was searching for a lamp with three bulbs with a capacity up to 100 watt as well as tall with a wide shade (but not too expensive). The base and post are very heavy; however, I'm disappointed that the pieces attached to the light bulb base are very flimsy, almost feel like aluminum. The lamp was very easy to put together, except for the last piece to hold the shade - there is hollow tube, a bolt, a washer and the filial, all present to attach the shade. However, upon first glance it doesn't appear there is enough length to the bolt to securely hold the shade in place. I'm not sure how my husband put the last piece together (I easily attached all the other pieces) - we spent a lot of time cursing the pieces to attach the shade (the one picture on the one page instruction is very unclear).